What It Is: Apparently I’m in a fashion-y mood. After yesterday’s shoe and boot post, it only made sense for me to delve into socks I suppose. And what socks they are. Living Royal is a purveyor of some of the most unique, standout socks I’ve ever seen – printed with vivid images generally tied to food, hobbies, and animals – although a few unique pop culture reference and spectacular pictures standalone as well (hello Burn Book socks!) I’ve only pictured the ankle socks above, but they do carry smaller collections in crew and knee high lengths, as well as some fun holiday picks. Hello stocking stuffers! Who It’s For: Your brother, so he can throw out his tatty white gym socks for something way cooler. Your daughter, to represent some of her passions in life – from art to soccer to her fave animal. Your spouse, as a fun reminder that good things await at home when discretely worn with a suit or boots to work. What It Costs: Each pair is $8. Shipping to Canada is a flat rate of $8. Where It’s At: The Living Royal website. Another chance to snap up a bonus entry into my Women In Clothes giveaway kiddos. Visit the Living Royal website above and tell me in the comments below: which pair(s) would you love to gift or get? I would like the Christmas lights knee socks. Can’t decide between the Cobweb crew socks, the Xray knee socks & the Skull ankle socks. As you can see I have Halloween on the brain at this moment. I would like the Fawn Ankle Socks for myself and the Flamingo Knee Highs for my grandma! I’d like these for me: Gemini Knee-High Socks, and the Cheetah Print Ankle Socks. Ha ha so funny! 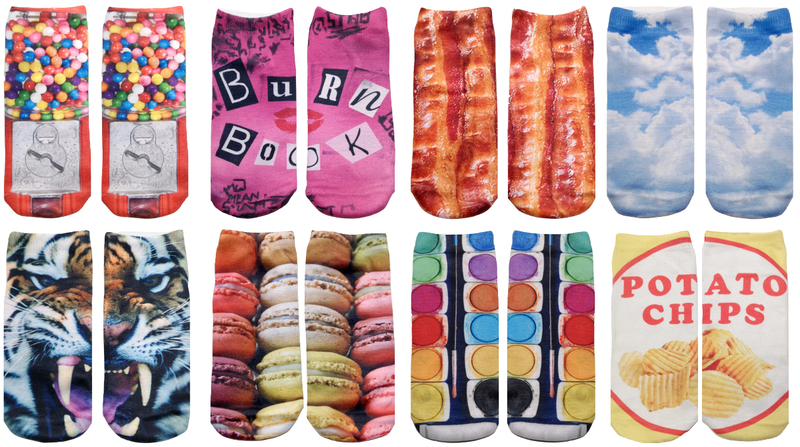 I’d like the bacon socks. Or maybe the Potato Chip socks! The donut knee highs are so cute!